My Simplot Twist on Hash Browns! While eating is my obsession, cooking is my passion! I love eating and cooking international cuisines. It’s just so difficult for me to stick to one cuisine since I live in a melting pot country where endless cuisines are there to tempt my senses. I am also thankful to my years oversea that I also got to add on quite a gastronomical adventure to my taste. Since I live in the States for a few years, I learn to love potatoes… all sorts actually! Then I discovered hash browns which seem to be a favorite in the American breakfast scene. Hash browns are potato which has been diced, riced or shredded and freezed. Simply pan fry, deep fry or baked these and the crispy potatoes make awesome breakfast sides to go with anything. Glad to know that hash browns is now readily available in many supermarkets. I buy these occasionally when I have some time for breakfast pampering. 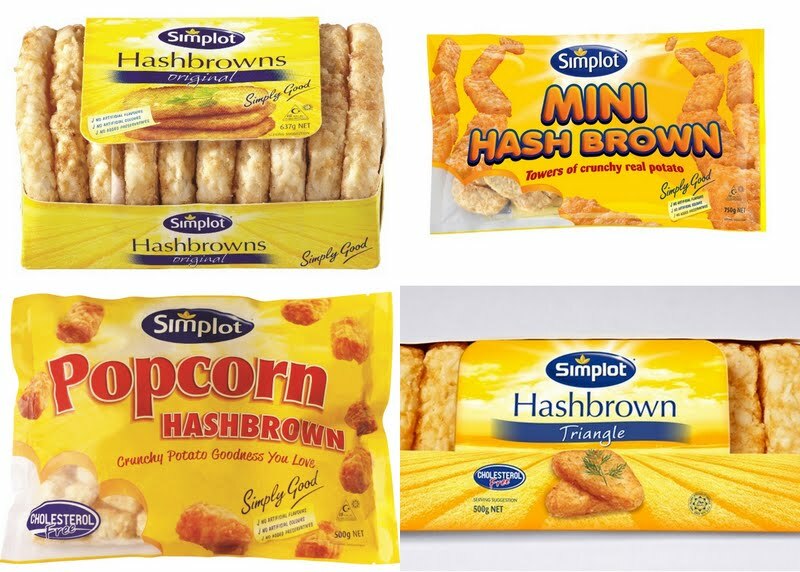 I find that Simplot has a good range of hash browns. They come in forms of regular rectangle hash browns, mini hash browns, popcorn hash browns and tater tots. 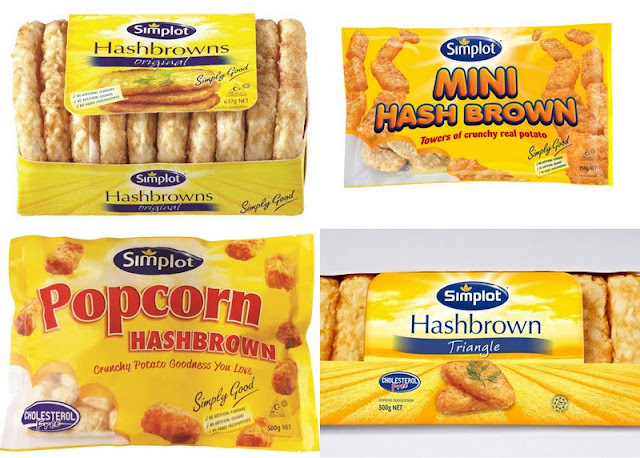 When I heard of the Simplot Food Blogger competition, I decided to put on my thinking cap and see what I could come up with using Simplot Hash Browns. A favorite dish of mine is risotto. I often made it at home for the family. There is just something heartwarming about oozing creamy al dente rice filled with various ingredients. Using Arborio rice, risotto is rice cooked with broth slowly till it releases its starch and thickens up the rice and its ingredients. An Italian dish, I love to flavor mine with cheese and spices. While I was brainstorming one day, I thought of Arancini, a fried risotto ball said to have originated in Sicily. Usually its rice cooked in a tomato sauce and shaped into little balls before being coated in egg and breadcrumbs and fried to golden brown. Well I thought what if I use Simplot Hash Browns to coat the rice balls? These would certainly add more depth and flavor to the Sicilian balls. Here, I am sharing my version of Arancini using Simplot Hash Browns! First, we need to make the risotto in advance as we need this to cool down. You can make a big batch and save some leftovers to make the Arancini too. Prepared all the ingredients such as the onions, shallots, garlic and stock. Start by heating up some olive oil in a pan to sauté the minced onions and shallots for a minute till its soft. 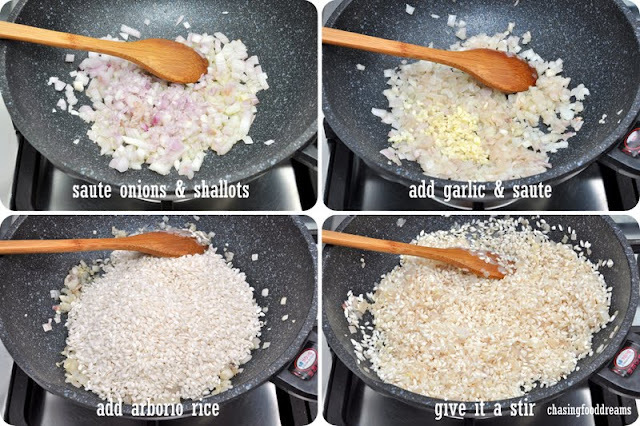 Then add in the minced garlic and sauté for another 30 seconds before adding in the Arborio rice. Give the rice a few stir. Have the stock heating in another pot by the side. Ladle one at a time of stock into the rice and allow the rice to boil on medium heat till the stock is almost absorb. Add another ladle of stock and repeat to let it boil till the stock is almost absorb. Continue this process of adding stock and stirring. 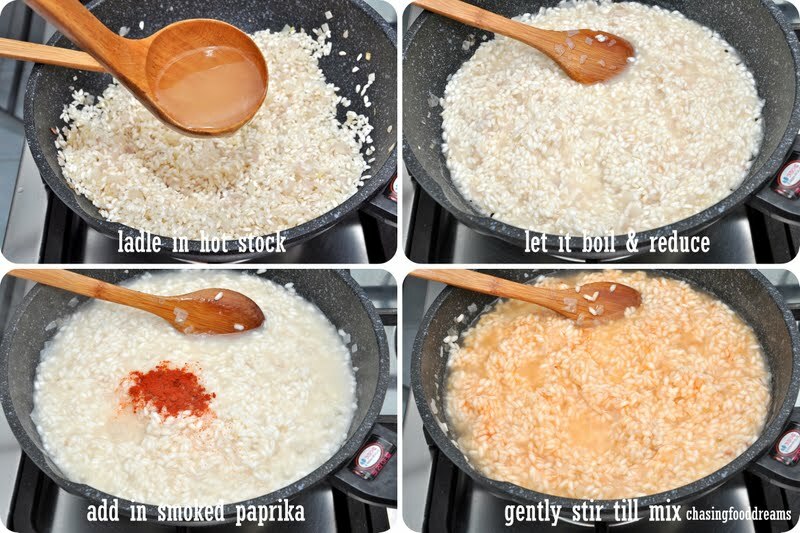 After 10 minutes of this process, add in the smoked paprika and give a stir till it colors and flavors the risotto. Finished up the stock and adjust to add water if the rice is still not soft enough. This process will take about 20 minutes till the rice is almost translucent. 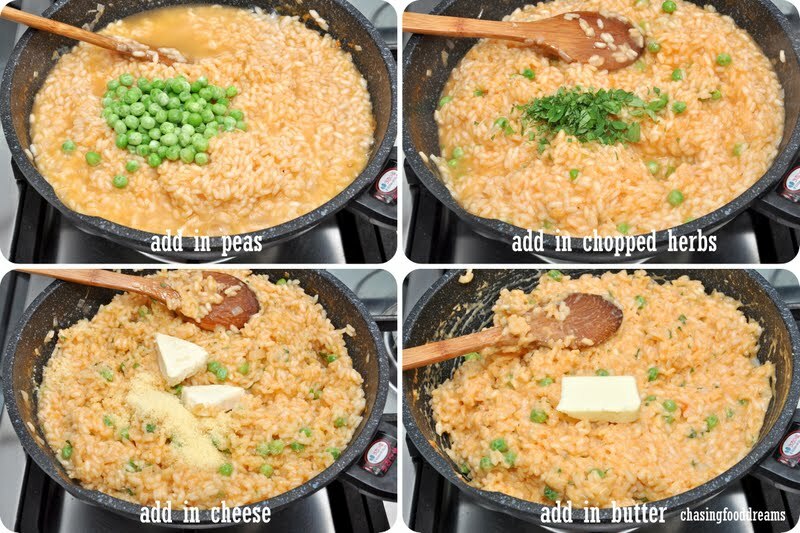 After the 20 minutes mark, add in the peas, chopped oregano, both cheeses and butter. Continue to gently stirring the rice till everything is well mix. By this stage, the rice is thick and starchy. Season the rice with salt and pepper. Turn off the heat and break the egg into the rice. Give it a final stir and let it cool. At this stage, the risotto is ready for consumption as well. While waiting for the risotto to cool, crush the Simplot Hash Browns with hands till it resembles panko breadcrumbs in a bowl. After the risotto has cool down, put the risotto in a bowl ready for another step together with the crushed Simplot Hash Browns. Using wet hands, shape the risotto into golf ball size. Roll these in the Simplot Hash Browns and firmly press the hash browns into the balls to ensure it sticks. The balls are then ready to be cooked or they can simply be frozen for later consumption. Heat up oil in a pot and deep fry the Arancini a few at a time. Do not over crowd the pot as you want an even cooking. Make sure to use medium heat and constantly shake or turn the balls for even cooking. Once the Arancini is golden brown, take these out and drain them. You can make these ahead and keep them warm in a low heat oven. Serve these golden Arancini with Leggo’s Pasta Sauce heated through. Leggo’s Pasta Bake Sauce range like Creamy Tomato and Mozzarella or Tomato, Ricotta & Spinach makes a delicious saucy accompaniment! These Simplot Hash Brown Arancinis are best served hot as you get oozing creamy cheese risotto contrasting beautifully with the crispy hash brown crust. Though the cheese is pretty strong in flavors, the potato flavors are distinctively present too. The tomato based sauce makes the rice balls even more delicious and addictive. I am submitting this recipe for the Simplot Food Blogger Competition. Good luck to everyone participating! That looks really good. Good luck to you and all joining the competition. Jia you, jia you!!!! That's a really good innovation! Creative!! This would b a great snack. Wish you lotsa luck! wow! so creative! this dish loooooks really great! good luck in the competition ya! Looks lovely! Good luck to your Jenn, I can't find Simplot hash browns in the supermarkets tht I go to, so gotta give this contest a miss. Creative!! Good Luck to You! I'm a huge fan of arancini. They make great bar snacks. Oh wow..I am impressed! The hash brown certainly looks great and all the best for you. You have certainly brought a new light on how I look at hash browns from now on !